A former coal mine is transformed into a cultural site. "The Colonia Vesela Association was founded in 2013 at the same time with the presentation of some of my architect colleagues' end-of-year projects as well as my own. It all started from the idea that the Colonie district in Petrosani, which is the biggest listed historical complex in the Jiu River Valley, is in need of a makeover, of urban regeneration. So we set up this association. We began with workshops for children, who all wanted their district to look more cheerful." "We received this award because of the events we staged in Petrila. 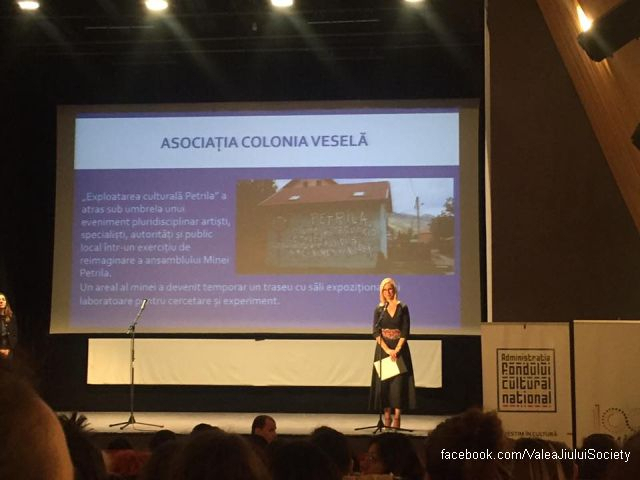 I must mention here that the Colonia Vesela Association is one of the founding members of the Planeta Petrila Association which contributes to the regeneration of the industrial heritage of the Petrila coal exploitation site and its transformation into an economic, social and cultural centre of the Jiu River Valley. In our capacity as founding members, we took on the management of the Petrila Cultural Exploitation Site project, which seeks to turn the former mine into a cultural site. The event was held last August and that's also when we renamed the mining compound a cultural compound, as the area had by then become home to cultural, sports and all sorts of other activities." "We basically built on the events held ever since 2014 and the interest generated by the Planet Petrila documentary film directed by Andrei Dascalescu and featuring Catalin Cenusa and Ion Barbu. In 2018, we staged 10 different cultural activities, including the Open Mines Day on May the 1st and the Petrila Cultural Exploitation Site project held between August 10 and 12. What we did was to temporarily activate the sites formerly used for mining activities, including the administrative rooms, the rooms full of industrial equipment, the routes used by the miners and those by which the coal used to be transported, as well as public spaces, footbridges, galleries and industrial infrastructures, all of which were turned into art exhibitions and art installations and venues for concerts and sports activities, in an environment that resembled the former mining compounds in the West that were transformed into cultural, economic and even administrative centres." "Staging events is our top priority, but there's always someone at the mine, and there are volunteers, including former miners led by Catalin Cenusa, who actually maintain the area. Meanwhile, on November 15 last year, the Mine Rescue Museum was founded, a museum unique in the country, which is set up in a former rescue station and which is open to anyone passing by. In fact, last year we had 5,000 visitors, which is a record number for a cultural site in the Jiu River Valley. What visitors can see at the moment is a post-industrial area turned into a space that is full of life, surrounded by high-quality architecture dating from the late 19th century, the inter-war years and the early days of the communist era." "For the first time since 2012, everybody agrees that the Petrila mine must become a cultural site that also serves an administrative, social and economic purpose. We're waiting for you in Petrila, you won't get bored there, on the contrary!"